For many households, the kitchen remains the most important room in the home. This isn't too surprising - after all, when it comes to hours spent cooking per week, Australia makes the top 10, according to figures collated by Statista. Given that you'll probably be spending a lot of time in this space preparing ingredients, cooking meals and socialising with your friends and family, it makes sense that you want your kitchen to be as functional as possible - without sacrificing the aesthetic of the room. Of course, your local home builder can help you design a kitchen that's as practical as it is beautiful, but with even more functionality. Here are five useful kitchen ideas. Shortage of storage space can be frustrating to the modern chef. Poorly organised cupboards and shelves disrupt the kitchen workflow, look terrible and can ultimately discourage you from cooking up a storm. If space is at a premium in your home, you'll need to think outside the box - or inside the cupboard, as the case may be - to maximise capacity. One easy solution is to install hooks on the inside of cupboard and pantry doors. Here, you can hang pots, pans, cleaning products, mugs and almost any other lightweight items that have a handle. Cheap plastic hooks will do the trick, but for a more elegant finish, consider investing in quality wooden or metal hooks that are in line with the overarching design of your home. Regardless of whether you've opted for a traditional or contemporary design in your new home, it's highly likely that there are more than a few magnetic surfaces in your new kitchen. With some creative thinking, you can put these areas to good use and get the most of out of your cooking space. Magnetic knife strips offer an excellent space-saving solution. For example, you could attach magnetic shelves or racks to the side of your fridge, dishwasher or other large appliances. Of course, they probably won't be able to support heavy items, but they're ideal for holding things such as herbs, spices and high-use serving cutlery. In addition, magnetic knife strips offer an excellent space-saving solution to conventional knife blocks, which take up valuable surface area that could be put to better use. For safety purposes, spend some time considering the best place to position the knife strip and be sure to keep it well out of reach of any young children. Your kitchen's visual appeal is a fairly all-encompassing concept, and extends far past the colour of paint you've chosen to paint the walls. In fact, every element of your kitchen from the texture of the bench top to the style of your fittings can have an impact on the room's overall design. 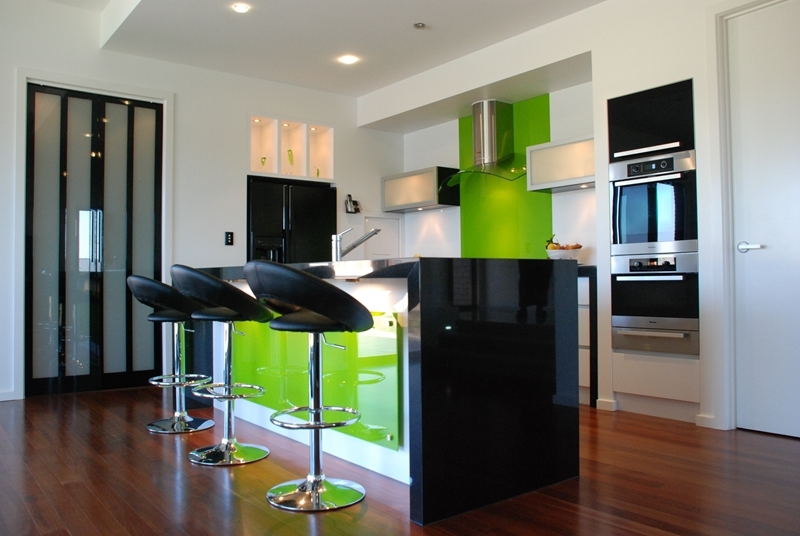 Domain noted that even your appliances - particularly those in bright, bold, beautiful colours - can add a lot of value to your kitchen's look. Red appliances will contrast wonderfully against rich and dark colour palettes, or go European and opt for glossy black in favour of the typical (and dare we say boring) stainless steel finish. Innovative cleaning strategies might be the last thing on your mind after building a new home, but eventually, you will need to give the kitchen a scrub - including the microwave. Anyone who's lived with frequent microwave users can attest to the fact that cleaning this particular appliance is easier said than done. However, as CNET explained, there is an excellent trick to help you easily get rid of any encrusted-leftovers and stains. When it comes to kitchen design, you're really only limited by your imagination. For a kitchen idea, consider swapping out some cabinetry for open shelving. While this trend has taken the design world by storm in recent years, there are a few tricks to getting it right. As Forbes contributor Becky Harris explained, one of the key elements of visually appealing open shelves is to ensure that the items you store on them have a very simple colour scheme. In addition, you can make your life easier in the kitchen by keeping your most frequently used items in easy reach on open shelves instead of locking them away behind doors. These ideas can help you make the most of your kitchen - but they're really only the beginning. Don't be afraid to get creative in your new kitchen and experiment with ways in which you can improve its design, flow or function.